Hello Bloggie Friends. 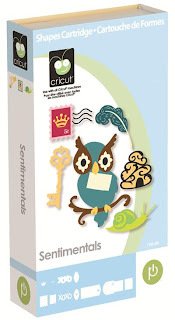 Welcome to another Cooking With Cricut Cartridge Showcase. I'm Larelyn and I'll be showing you some projects using the Sentimentals cartridge. The reason I wanted this cartridge was because I thought it had the most fantastic butterfly. I'm really guilty of doing that - ordering a cart for one special cut! Fortunately I discovered lots of other fabulous ways to put Sentimentals to use. It is a full cartridge that includes Phrases, Tags, Cards, and Envelopes along with the Base, Layer, and Shadow cuts. It's a great place to find your common Tag shapes all in one place and each page in the handbook has a card with matching envelope - great for cutting and assembling a card in a hurry. So here we go with some projects using the Sentimentals cartridge. The first two projects feature the butterfly - the original reason I purchased the cartridge. These next two feature two of the mats that are found in the Base images. Here is one of the many Phrases. Thanks for joining me today. It's always fun to dig into our cartridges to discover different ways to use them. A-MAZE-ING! What a wonderful showcase Larelyn! What great ideas and inspiration. Please be sure to head over to Larelyn's Blog and give her some love for this wonderful post! This is such a wonderful showcase. You really did the Sentimentals cartridge right! Each of your projects is beautiful with so much detail. Thanks for sharing your talent with us in this fabulous showcase! Beautiful projects and I agree the butterfly is awesome. Thanks for sharing this wonderful cartridge. Your work is amazing. Thanks for the great inspiration! I need to dig this cart back out and use it!